the exclusion of harmful chemicals. 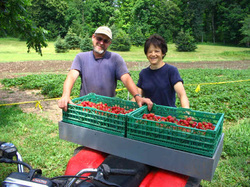 All maintenance and improvements are done "in-house", and the operation of the farm involves the entire family. So it is with devotion to the land, dedication to farming, and appreciation of the quality our customers are looking for that we bring our products to you.